Use props for a scavenger hunt! Planning Halloween parties for older kids can be tricky. After all, they are past the pumpkin carving and trick-or-treating stage, but not quite ready for a teen party, either. Make your 9 to 13 year old's party one to remember with one or more of the following activities. Although Halloween itself is enough of a reason to throw a party, older kids may expect more than just bobbing for apples and eating Halloween candy. By hosting a party with a narrower theme, you can be sure to keep everyone happy and entertained. Older kids are often fascinated by the concept of ghosts and the spiritual world. Play upon this aspect by hosting a séance. Keep it lighthearted by only "contacting" people like George Washington, Elvis, and other famous figures. Hire an actor to play the part of the spiritual guide or conduct the séance yourself. To school yourself in how people create various special effects read How to Have a Séance: Tricks of Fraudulent Mediums on PrairieGhosts.com. In addition to a séance, you could have tarot card readings and an Ouija board available for kids to use after the main event. Hosting a Halloween party that doubles as a haunted house involves a lot of work. Luckily, this age group is perfect for them. They are not so young as to be scared, but young enough not to figure out how you set up the tricks. Visit several haunted houses in your area and figure out what you can set up in a basement or garage with minimal expense. Consider asking another family to co-host the event, as a haunted house party can be a time and labor consuming task. Alternately, if you like the idea of a haunted house party but don't want to go to the effort of creating your own spooky setting, consider visiting a local haunted house with the party attendees. Have all of the kids meet at your house for transport to the haunted house, or arrange to meet the attendees at the location. After the tour, have everyone go back to your house for food and drinks as well as Halloween games and activities. Keep in mind that you'll need to enlist the assistance of other parents to help with transportation. Host a costume party with a twist. All party-goers must come costumed as their favorite villain from a movie. Host a best costume contest, where kids vote for their favorite costume. Provide papers with each child's name listed and have kids guess who each villain is and what move the villain is from. Make guessing the main entertainment of the evening, by holding a "20 Questions" style party game. Let kids ask each other up to five questions that can be answered with a "yes" or a "no." Once everyone has had a chance to speak to each other, put out the food and collect the guessing sheets. Figure out the winner and award a prize before everyone leaves. 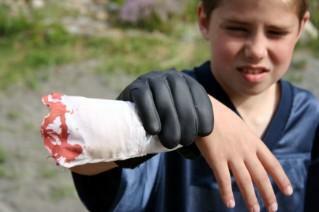 Host a scavenger hunt at an older kids Halloween party. Divide the kids into teams and give them a list of approximately 10 items for them to find. Hide the items outside, in a barn, or in a decorated area of your home. Items on the scavenger list could include a broom, witch's hat, black cat (stuffed), body parts, pumpkins, and more. Have small party favors as prizes for the winning team. Not everyone has the time to create a Halloween party at their own home. Setting up party decorations and pre-party cleaning and cooking can take up a considerable amount of time. Therefore, finding a different venue to host the party can take a load of a parent's shoulders as they plan the party. A number of places will offer special discounts to groups, as well as have Halloween themed activities as the holiday draws near. Before booking the event, find out exactly what is provided. Make sure you can bring in extra treats or food if it is not included in the Halloween party package. While it may be tempting to put out "bat's eyes" or "Frankenstein brains" at a Halloween party for older kids, they are most likely to find the gimmicks childish. Instead, put out familiar favorites like hamburgers, hot dogs, pizza and potato chips with a few spooky touches as part of your party menu. Although throwing a Halloween party that pre-teens will enjoy sounds like a scary idea, it can be made easier by keeping in mind the maturity level of the guests. While some kids may be ready for a haunted house, others may still be frightened. Ask your child for his/her ideas while planning the party and it is sure to be a hit.